I came across this quote by Oscar Wilde which really made me stop and think. I actually paused and thought what he actually meant by it. It is the mere importance of FOOD. All of us eat food to live. But there are few (like us, who totally indulge in food) who savour the taste and relish their each meal. In a fast paced society, where everyone is competitive and busy in their chores and work, I would suggest take out time for your meals where you enjoy it. A thoughtful meal can actually win anyone’s heart. A food has such a deep connection with our soul. The time taken to think and prepare the meal actually puts lot of your concern, love, positivity towards the food prepared. There is no one who denies the effort and the love with which you cook. So go ahead and make someone feel special and feel loved and create something exotic!! The fact that I love food soo much is because I can show my love for people around me through my food and it also gives me a chance to explore the creativity in me. So there are many time when I create my own recipies ad I am thrilled. This vegetable fried rice is one of them. Rinse the rice in a few changes of cold water. Drain the rice well in a sieve. In a medium, heavy bottomed pot with a tight fitting lid, combine 1 3/4 cup water, the rice and a bit of olive oil and salt. Bring to boil over high heat. As soon as water is boiling, lower the heat to simmer and cover. Cook at a gentle simmer until the water is completely absorbed and rice is tender, about 12 minutes. Remove the pot from the heat and let it sit, undisturbed with the lid on, for atleast 5 minutes and for as long as 30 minutes. Remove the lid, fluff the rice gently with a fork. Keep aside. Mix the vinegar, red chili sauce, soya sauce and salt. Keep aside. Heat a skillet with 1 tbsp vegetable oil. Add onions, when transparent add garlic. Gradually add carrot and beans. Let it cook for 2 minutes. Add the scrambled egg. Now add the rice in 3 batches. When you add for the first time, mix the rice carefully with the vegetables (not breaking the rice). The second time you add, pour the vinegar mixture evenly all over and add red bell peppers. Mix carefully. Finally when you add rice, mix along the yellow bell peppers and the scallions and mix it carefully. Though I live in North India and mostly eat North Indian cuisine, but there’s something about the food from the south which attracts me. I love the tanginess in the South Indian food. The flavors of lemon, tamarind, curry leaves and nuts are to die for. One of my hot favourite amongst all the food is ‘Lemon Rice’. Lemon Rice has a peculiar taste. 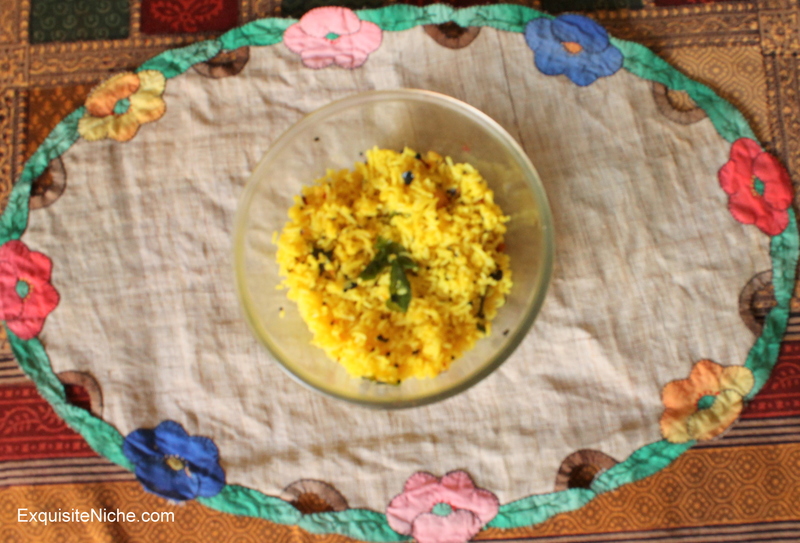 It comprises of strong flavors of mustard seeds, lemon and curry leaves. The ingredients in it make it different from the usual fried rice we have. It can be accompanied with raita (yogurt salad) or popadums. The benefits of preparing lemon rice: 1) easy to prepare, 2) can be made of leftover rice, 3) can be prepared within minutes with cooked rice and 4) tastes delicious and a complete meal. Heat oil in a pan. Put mustard seeds, curry leaves and green chilies. Fry till the spluttering stops and add the ginger and peanuts. Fry for another minute. Add turmeric powder and turn off the fire. Add lemon juice and mix well. Add rice, coriander powder and salt and mix well. Kheer (Indian Rice Pudding) is the most common dessert of the Indian household. It is relatively simple to make. Unlike the westernised ways to bake the rice pudding, in this case we make by boiling. Out of all the rice puddings, this one is my favourite. Firstly, boil the rice along with the milk on a medium flame, until the rice is cooked. Give it a constant stir to ensure the milk does not burn at the bottom of the pan. Secondly, add condensed milk, raisins, pistachios and sugar. Stir until the sugar is dissolved and the mixture is thickened. Thirdly, add cardamom, serve it either Hot or Cold. But I usually prefer cold, as it tastes divine. Finally, garnish with pieces of pistachios. Had to taste, t’was so tasty! !